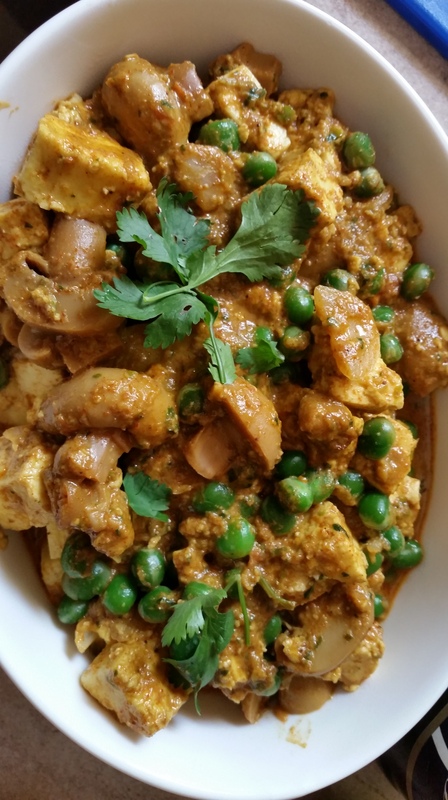 I’ve been told by an Indian friend that paneer (cottage cheese) with peas is a good combination, but the addition of the button mushrooms makes it a weird one. Maybe to some, the combination might not feel right, but trust me. It does. And it’s absolutely delicious! Typically, paneer with peas is called “Muttar Paneer”, which refers to paneer in a tomato- based dish, flavoured with garam masala. The dish I made doesn’t have any tomato, but you may add it depending how you feel. I generally use the Shan Garam Masala mix (pictured below), which is quite good and flavourful. However, if you feel you’d like to make your own Garam Masala- Sumayya at My Tamarind Kitchen has a perfect recipe, which you can find here. Paneer is one of my favourite Indian dishes and it’s one of the easiest to make. There are many different ways of cooking paneer: muttar paneer (paneer in a tomato-based sauce), palak paneer (paneer in a creamy spinach sauce), paneer tikka masala (paneer in a spicy sauce), as well as shahi paneer (paneer in a creamy tomato- based sauce) among others. Paneer can be served with other meats, and eaten with naan, chapatti or plain basmati rice. Frankly, I can even eat it all by itself! It’s that yummy! It’s also a healthy way of getting proteins into your diet, especially for a vegetarian! So enough with the talking; now on to the cooking! I adapted the recipe from Best Ever Cook’s Collection: Indian by Shehzad Husain & Rafi Fernandez). In a food processor, mince the onion, green chillies, mint, coriander, garlic, ginger, spices and yoghurt together, to form a fragrant minced paste. In a pan, heat the oil and add the spice paste. Heat the paste until the onion smell no longer lingers, and the oil begins to separate. Add in the mushrooms, peas and paneer. Mix well and cook on a low heat for about 7-10 minutes. If you would like a more runny curry, you may add about a tablespoon more of yoghurt, after the mix has cooled slightly. Garnish with some chopped mint/ coriander leaves and serve hot!